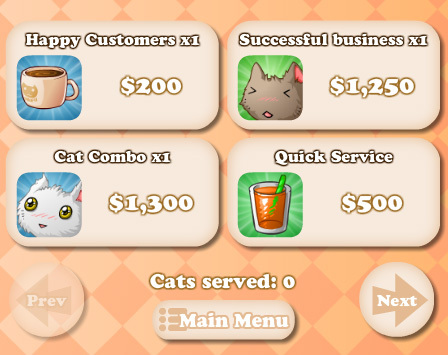 Finished the achievements for Cat Cafe! As you can see, you get some in-game money for completing them. A lot of them also have multiple levels; basically several similar achievements grouped together into one. I also added in alternative animations for all of the cats, so now there’s 3 or 4 variations of each animation. You’ll see these in action fairly soon. Hopefully the game will be ready for beta testing in 3 days or so. 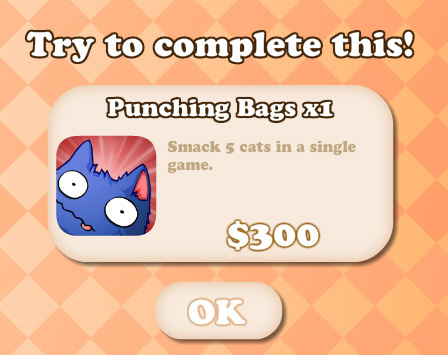 Punching Bags x3 is 125 cats! This entry was posted in Cat Cafe, Game News on October 10, 2013 by Matt Roszak. I wanna be a beta player! plus cool achievements! You might get hired just for the achievements you make. how do i beta test HOW! ?